“There’s no shortage of great things to see and do in Hyde Park, but there is a shortage of great places to stay,” said Lori Rackl in the Chicago Tribune. 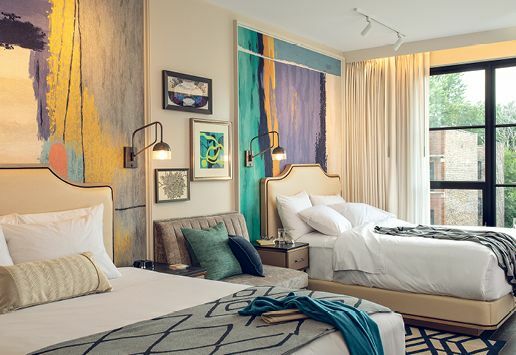 Fortunately, the Chicago South Side neighborhood has received a shot in the arm with the debut of a boutique hotel inspired by Hyde Park’s history as a hotbed for artists and intellectuals. Jazzy décor fashioned from brass instruments fills the lobby, while laboratory beakers adorn shelves in the science-oriented bar. The 98 guest rooms, meanwhile, feel like lived-in apartments, complete with record players and local blues on vinyl. Spring Creek Ranch, near Grand Teton and Yellowstone national parks, has a three-night package including a safari in Grand Teton and the National Elk Refuge, for $999 per person, double occupancy. Travel Nov. 9–Dec. 3. Thursday arrivals only. Through November, Authentic Vacations is slashing prices for three Ireland itineraries to $598. The “Cove to Coast” trip includes a rental car, seven nights’ accommodation (three in a castle), and stops in Killarney and the Ring of Kerry. Hotel Schwarzbrunn, an Austrian wellness resort and spa in the Tyrolean Alps, is offering a five-night stay starting at $664.50 a person, through November. The package includes all meals, guided hiking tours, and a massage.